Santa Clara University is a selective mid-sized Jesuit school located in Silicon Valley, about 50 miles from San Francisco and 15 miles from Palo Alto. The Spanish architecture and lush gardens are typical of the area. The location makes for excellent on-campus recruiting and internship opportunities from companies like Google, Cisco, and Apple. Classes are small and all classes are taught by full professors. In the Jesuit tradition, there is a focus on cultivating well-rounded scholars, creating citizens of the world, and service to the community. And because of the Silicon Valley location, there is a noticeable emphasis on innovation and technology. The Core Curriculum is centered on three goals — Knowledge, Habits of Mind and Heart, and Engagement with the World. The Core is supplemented by the Pathways Program which gives students the opportunity to take three or four courses within a common theme such as Leadership, Ethics, Human Rights, Sustainability, and Democracy. Within the chosen theme students study the subject from a number of disciplinary or methodological perspectives. Students declare a major at the end of sophomore year. The quarter system allows for lots of academic exploration and frequent double majors. 55% of students are in the School of Arts & Sciences and it can be a challenge to transfer from Arts & Sciences into the Business and Engineering schools. There are however, a few minors (Economics, Entrepreneurship, Retail Services) in the Leavey School of Business that are available to Arts & Sciences students. Many students do pick up a second major or minor in performing arts. One of our tour guides was majoring in Biology and Theater and the other was studying Computer Science and Engineering and pursuing a Music minor. The majority of students are from California but there are 38 states and 21 countries represented at SCU, and a good amount of racial diversity on campus. Most freshmen and sophomores live on campus. Freshmen live in Residential Learning Communities (RLC) which are dorms grouped by academic or social interest. Residents of each RLC take some classes together and Community Facilitators organize social events, study halls, and community discussions for residents, which help freshmen find community and make friends quickly. Even though SCU is a Jesuit school, there is a small, independent Greek System. Many of the Greek social events are open to the entire campus. There are over 100 student run clubs and organizations with the most popular being Ruff Riders Booster Club, Into the Wild Wilderness Club, Student Government and the Activities Planning Board. The social life on campus is active with parties and school sponsored events, and there is always a crowd at The Bronco, an on-campus sports cafe. There are only a few bars and restaurants close to campus but students often go by car, Uber or Caltrain to Palo Alto, Santa Cruz and San Francisco. Religion is definitely present on campus, but students are free to participate as much or as little as they’d like, and a few students told me that they would guess that about half of the student body goes to church regularly. The beautiful and historic Mission Church sits in the center of campus and hosts a student-led 9:00pm Mass. Students are required to take three religion classes with many classes focused on contemporary issues and world religion for example, Religions of the Book, New Testament Narratives of Cinema, and Apocalypse Now: How the World Ends or Doesn’t in Judaism, Christianity and Islam. Students praise the Career Center. SCU hosts quarterly career fairs during which more than 100 companies visit campus. There are separate fairs for freshmen and sophomores and there is a Career Specialist always available to help with interviews, resumes and job searches. SCU has 20 Division I sports teams, but no football. Even though the student booster club, the Ruff Riders, is the most popular club on campus with 4000 members, SCI is not as “rah-rah” as many other DI schools. In fact, there is just as much excitement around intramural sports with almost 600 teams, 75% of students participating, and lots of faculty involvement. There is a positive, happy atmosphere on campus. One student told me that people are generally kind and respectful to each other: “It’s the kind of place where people hold open doors for each other.” Another student said “We focus on understanding and respecting each other and communicating across differences.” When I was on campus I saw current students go out of their way to engage and help visiting prospective students. I also saw the Student Organization Fair when hundreds of students were out in front of the Student Center promoting their clubs to freshmen. It was notable how much fun the students were having and how people were visiting different tables and socializing across groups. The political vibe is fairly moderate with active Republican and Democratic organizations on campus. An interest in social justice and community service unites the student community. SCU is looking for applicants who have challenged themselves in high school with 4-6 honors/AP/IB classes and have made a substantial commitment to community service. Students at SCU enjoy everything that Northern California has to offer: A pretty, green campus, fair weather, proximity to the coast and other vacation destinations, and fresh and local food. I especially recommend the Tuna Poke Bowl at The Marketplace. 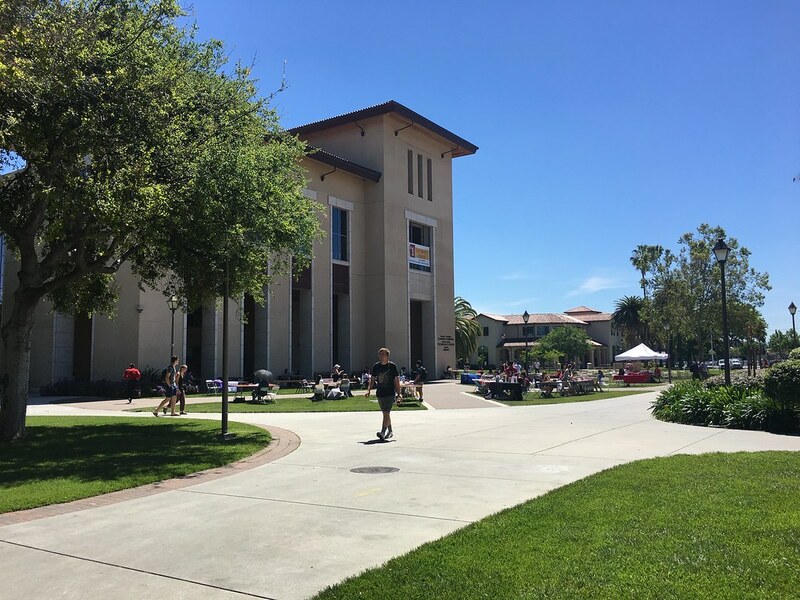 Santa Clara is a great school for students who are interested in a mid-sized college that emphasizes both academics and community engagement.